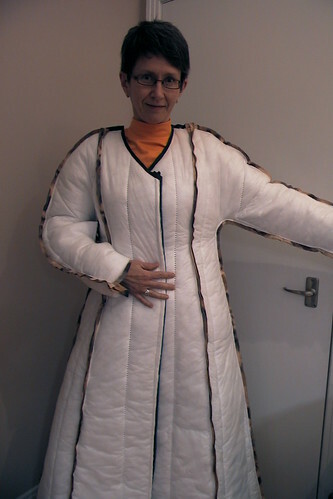 Retrofitting the coat pattern - next time, make the muslin first! I assembled a muslin out of a rather stiff canvas-y fabric so that I could test my gusset-making skills. 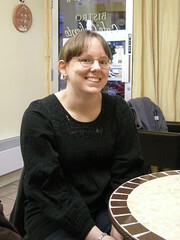 I've taken photos along the way to document my attempts, failures and "progress". It does not really feel like progress when you start to progress from 3 steps back! On the right sleeve (to the left in the photo) you can see the original design. I have no range of motion because the arm attaches to the body of the jacket far too low. When I try to lift my arm, the body of the jacket comes right along. 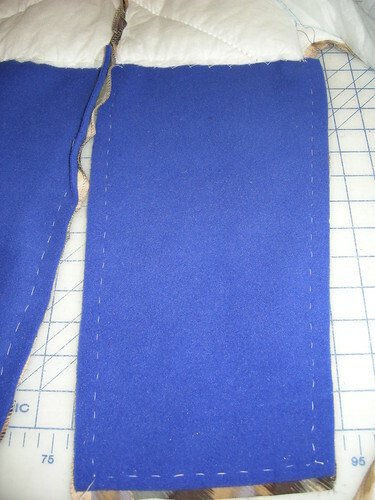 The next step was to figure out how far into the jacket body to slash so that I could insert a gusset. I did this very unscientifically! 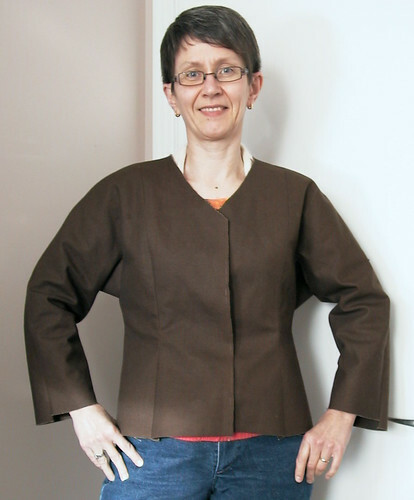 Wearing the muslin and looking in the mirror, I took a white marking pencil and located the top of the slash by feel/instinct where it seemed that if opened up to that point, the "hinge" connecting the sleeve to jacket body would give me enough room to move. Then I had my husband figure out where the corresponding point would be on my back. This turned out fine, somewhat to my surprise. On the left sleeve (right of the photo) I have inserted a gusset which turned out far too big. I did not modify the original underarm seam. 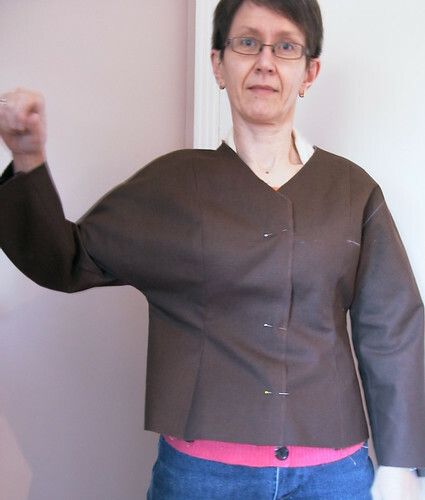 With that very low underarm, I needed the gusset to be this size to achieve an acceptable range of motion for my arm. However, it is UGLY! On to my next experiment. 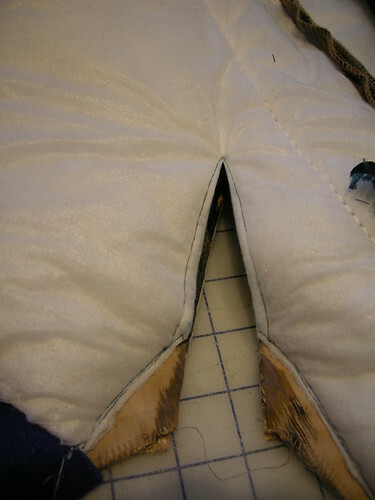 I realized I could turn the original upside-down U shaped underarm seam into a higher pointy-cornered seam. In the next photo you can see my pencilled changes on the pattern piece for the back, including the line up into the body of the piece, which marks the slash where the gusset will be inserted. The effect of this change is to raise the insertion point for the gusset, meaning the gusset will not have to be quite so wide to give the same range of motion. 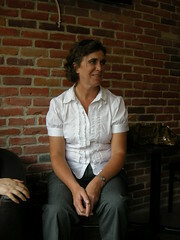 And here you can see the result of the smaller gusset (inserted in the right sleeve, to the left of the photo). It's a little cleaner looking than the big gusset on the left sleeve. I look a bit happier with this experiment now. Wish me luck translating this change, and a few others I thought of while puzzling over this problem, into my actual coat. My husband says my latest project, in progress, looks like a cartoon drawing of a coat. Proof is in the picture to the right. 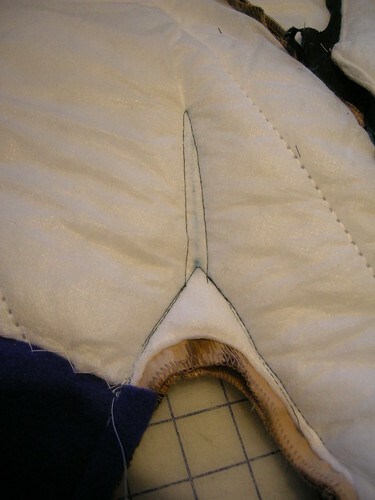 I'm not so troubled by the look - what you see is the Thinsulate, which has been sewn to the lining and facings. It'll be covered by the fashion fabric, once I get further along. My problem is the fact that the sleeves leave me with virtually no mobility. The depth from shoulder point to underarm is about 11" (28cm) which is FAR too much. The arm parts from the body just a bit higher than my bottom rib. 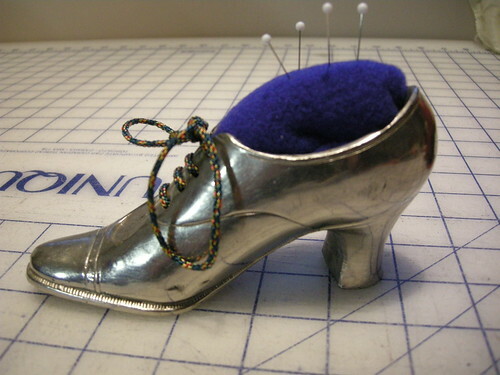 Methinks I will have to insert a gusset. This does NOT make me happy! I'll have to read up on gussets. To free up the sleeve from where it is tethered next to my ribs, I figure I'll need to slice at least 9cm (3.5") up on either side of the underarm seam. 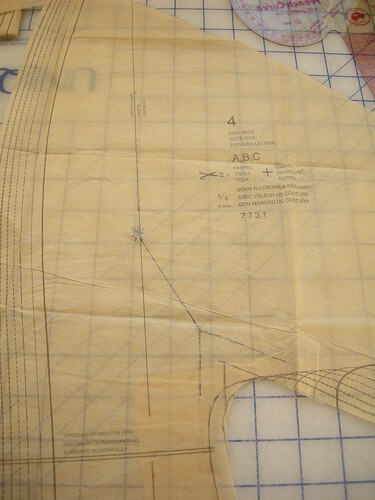 I'll first open the seam, figure out the placement for the cut, and sew a line of stitching on either side to anchor the lining fabric and Thinsulate. I'm not looking forward to the sewing of the gusset. I think I'll underline it with something less bulky than the Thinsulate - perhaps some 100 weight Polartec. What say any of you experts reading this? All advice including references to articles or books will be gratefully received. I've now washed (cold water) and machine-dried the cotton/bamboo rayon Spoonflower fabric. 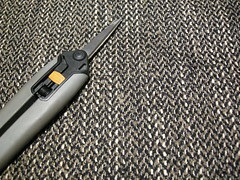 The original length of 2 yards exactly (72" or 183cm) has shrunk to 69.25" (176cm). That's about 3.8% shrinkage, which seems a fair amount to me. The printed width, post washing, is 51.5" (131cm) - Spoonflower's site says the printable width is 52" so I think it shrank a small amount in width too. That's after pressing it with steam - the unpressed fabric was drawn up so even shorter. 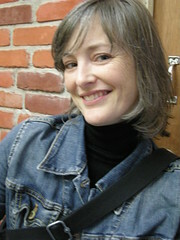 The other thing that happened in the wash was slight crocking of the flat dark-grey background, as you can see here. I don't mind it as it gives a slight texture to the previously completely unvaried background - makes the grey look more like the rock you would scan for a trilobite fossil. I wrote that last sentence, and then went looking on Google for pictures of trilobite fossils from this area. My gosh, I was right! Check these out! 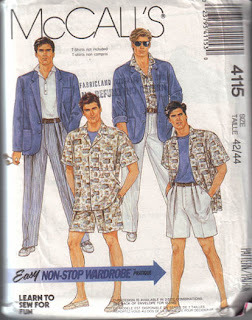 I think I'm going to make it up in a much-used men's casual shirt pattern, the very long out-of-print McCalls 4115. 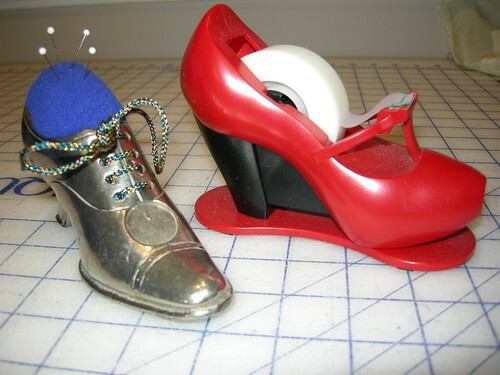 So here are two projects in the queue chez The Sewing Lawyer. The first is my next winter coat. Winter is, they say, coming again this year, and we must Prepare. Today it was below 0 degrees (celsius) so they must be right. I do own several winter coats already. 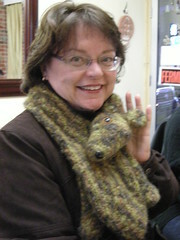 I made a nice wool one last year, taking part in Marji's Great Coat Sew-along. It is very warm. And. Very. Heavy. Despite the fact that it is really not much more than a single layer of fabric (OK, plus a wind-stopping interlining of mystery fabric, and Kasha lining). It was a magnum opus of sorts. I used a vintage Vogue pattern and everything, and it wasn't even my size. Oh, and the pattern would not have made a winter coat that would go over anything more bulky than a light cashmere twinset. So I did have to modify. You can read about my coat project here and here and here and here. For those not interested in the long tale or details, here is my finished coat. Yes, that is heavy wool coating cut on the bias. It really worked! This year I thought I'd make a different kind of coat altogether. One that would be presentably elegant, would cover any wardrobe item I might choose to wear in deepest winter, would be warm, but would be L I G H T. This requires abandonment of heavy wool, and the embracing of impermeable synthetic fabrics and Thinsulate! For my pattern I chose a Burda envelope pattern, number 7731. Like my heavy wool coat, this one is quite long and has a nice easy A-line. It has an interesting collar. 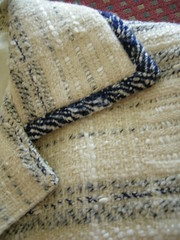 Unlike my heavy wool coat, it has no difficult-to-sew details. The sleeves are cut-on. It has princess seams. It does have pockets, unlike the ostentatiously impractical Vogue Couture pattern. And it will not be heavy! I had a marathon cutting-out session a few weeks ago. But I'm having trouble getting into this project. More to come. I'm also going to be making men's shirts. I've asked my husband how he would like to be referred to here - he didn't go for "Mr. Sewing Lawyer" so "my husband" he shall remain. Anyhow, he has designed some fabric for himself, which he had printed up at Spoonflower. 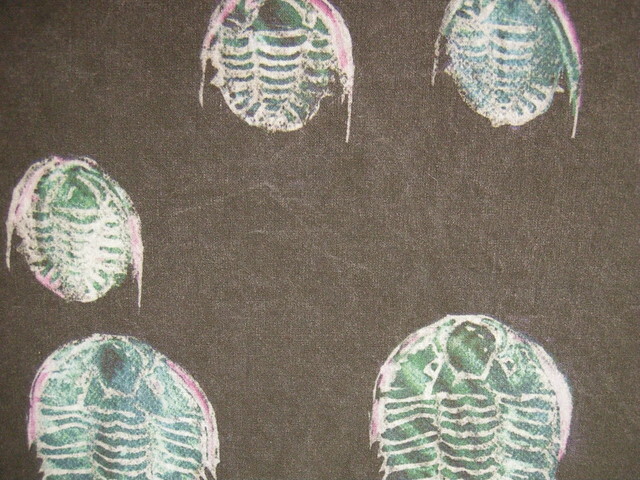 The motif is trilobites. These ones are from the Ordovician era (488 to 443 million years ago, give or take). 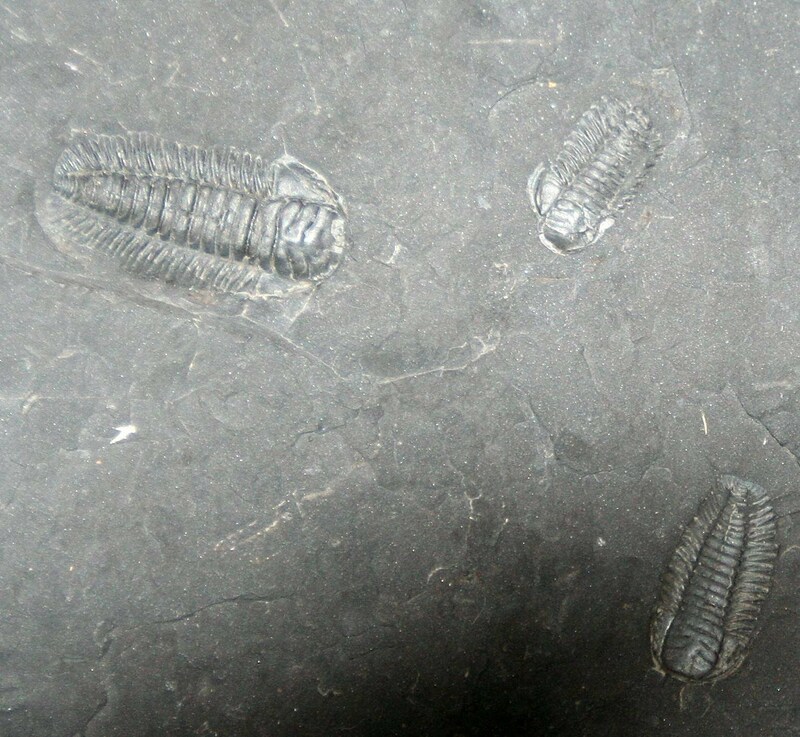 In our city (Ottawa, Ontario, Canada), the sedimentary rock was laid down in this time period and fossils of trilobites and other creatures of the time can be found, if one looks carefully. 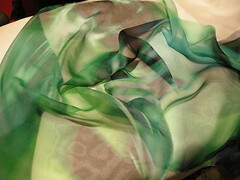 The fabric is Spoonflower's bamboo and cotton blend rayon ($27US per yard). It's very smooth and nice. 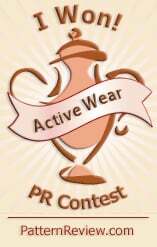 I haven't prewashed it yet but will do so and report on shrinkage. My husband created the image using rubber stamps cut out of gigantic pink erasers. The stamped images were then coloured with chalk pastel and scanned. He manipulated the scanned image using PhotoShop. Stencils were also involved. The resulting print is very attractive, and it's going to be my job to turn it into a truly one-of-a-kind shirt. Stay tuned. A friend of mine actually likes to shop, and she finds the most astonishing things at thrift shops. 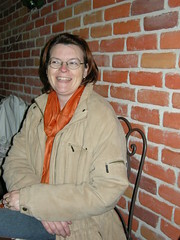 Today, I'm going to show you one of her finds. She bought it because it was too good to leave in the store, even though it didn't fit her. I'm the beneficiary and have had the pleasure of owning this jacket for several years. I'm now in the process of replacing the lining, which was shredding. I thought to document the jacket before proceeding. So, I introduce to you my vintage Auckie Sanft jacket. I can't say exactly when this was made but it was probably the mid-1970s. It is very close fitting and came with a mid-knee length, matching A-line skirt with a plain back and large box-pleated front. The skirt never fit but I have worn the jacket a lot. 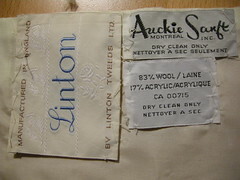 Auckie Sanft was a high-quality Montreal manufacturer. 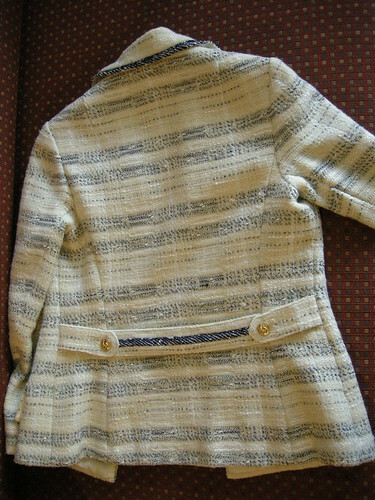 Perhaps this jacket was designed by John Warden, though maybe not, as it seems Warden did not work with Auckie Sanft for long. Whoever was responsible for it was a master. There are several things about this jacket that are special. First, the fabric. 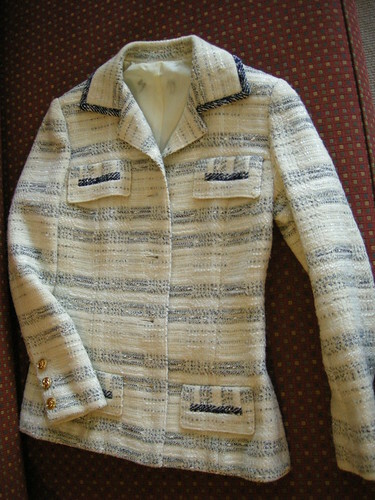 This jacket is made from beautiful Linton Tweed. "There has never been a Chanel collection without Linton tweeds", apparently (according to a 2004 story on Scotsman.com News). I believe it! 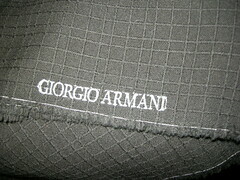 This fabric is absolutely luscious. 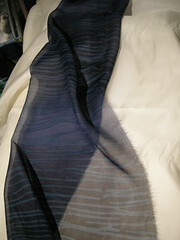 It's predominantly cream, with novelty threads in silky/shiny white, dark blue and white, and soft grey woven through it to create an irregular plaid. The label says 83% wool, 17% acrylic. From a distance, a little unfortunately, it looks like a horizontally-striped jacket. No matter, it's gorgeous! Here's the back. The stripiness of the fabric tells an interesting story. First, it's beautifully matched at all body seams, and the sleeve cap matches perfectly, but only in the back. Hmmmm. 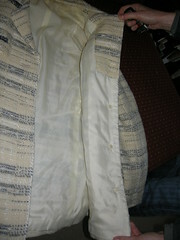 In the front, the sleeve cap is not matched to the jacket at the armscye, but the sleeve and body do match lower down. This is a mystery! 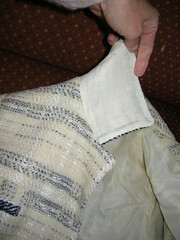 The solution is that the upper pocket flap disguises a little seam which does not match. It has something to do with the bust shaping provided by the princess seam. The designer used what I believe was the darker blue selvedge edge of the fabric to provide a coordinating trim found on the pocket flaps, collar and back belt. The next feature of the jacket is that the maker has reduced bulk almost everywhere by using lining fabric as facing - the collar, pocket flaps and front are lined to the edge. 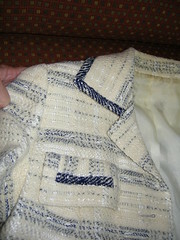 There is also very very little internal structure in the jacket. There is a very light shoulder pad and very light-weight and supple canvas (possibly linen?) 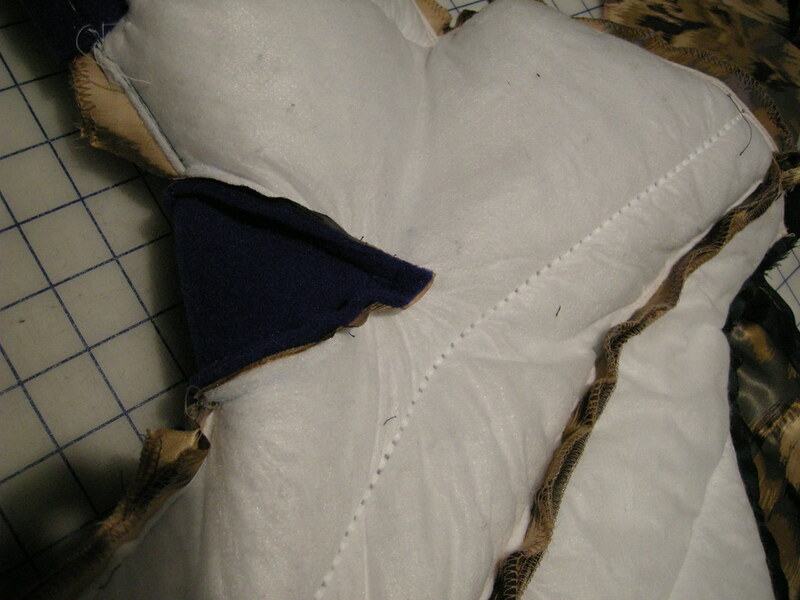 at the front edges, around the armscye, and behind the pocket flaps. 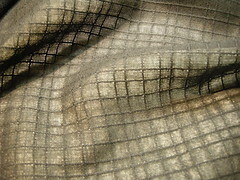 The chest area has a single layer of a slightly stiffer woven interfacing. 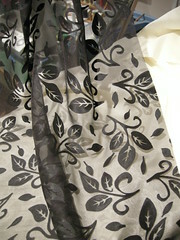 The back shield and hem interfacing are the softer canvas, cut on the bias. 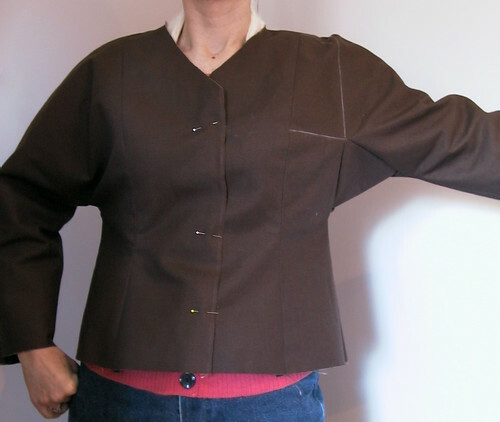 I believe there is no interfacing at all in either the collar or pocket flaps! 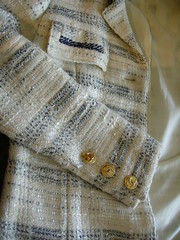 Only the lapel area, sleeve hems and vents are not faced with thin lining fabric. The sleeve hems are bulky! But check out the Chanel buttons. Are they real?? Check out all photos in more detail at my Flickr page. I don't really have time for this... But sometimes it may be good to have a place to record what I'm working on.